NATIONAL– The women of AF3IRM take to the streets in six cities for May Day 2014, for International Workers’ Day, in solidarity with women workers here in the United States and abroad. In New York, Los Angeles, Oakland, Long Beach, Santa Ana, and San Diego, we call on all women to rise up, and join the workers of the world to demand justice and dignity. As labor organizer Dolores Huerta said, “Walk the street with us into history. Get off the sidewalk.” As anti-imperialist, transnational feminists, we march and we walk these streets with our allies for workers’ rights! We are inspired by our comrades here and abroad who have chosen to make history and to fight against corrupt corporations and capitalist exploitation. We speak out in solidarity with the women workers in China who fought for just compensation and legal contracts with the manufacturers of Adidas and Nike products and who now face government intimidation; with those fighting to increase the minimum wage to a living wage; and with the countless number of workers and unions, from sectors such as health care, education, farmwork, manufacturing, and transportation, who striked and are striking not only here in the North America, but in Bangladesh, the Philippines, Colombia, India, Cambodia, Peru, and other countries worldwide. Women workers voices ring out loud as they make their demands heard. We hear them and we speak out for all of our rights as women workers. This year, we march, with our boots on the ground loudly echoing the chants for justice–and we call special attention to the continuing feminization of poverty. Now more than ever immigrant women and women of color, face lower wages, less or no benefits, and unjust discrimination! Women have higher poverty rates than men, with a third of women living in poverty or on the brink. Women make up more than two-thirds of the low-income and minimum-wage workforce and they make less on average than their male counterparts for these same jobs. Asian and Pacific-Islander women make up 3% of the population and 4% of low-wage workers. How can our families survive if women are made to work harder and our work is less valued? Indeed, despite the privileged calls for women to “lean in,” it is hard to deny that women, especially transnational women and women of color, are struggling. We will not lean in–WE WILL MARCH FORWARD! We transnational women march these streets because we look around – into our own lives, our families, and our communities and we know the reality of this injustice and inequality. Even as transnational women and women of color seek jobs and act as breadwinners for their families, they are paid less than their male and white female counterparts, with black women earning 64 cents and Latinas 55 cents to every dollar a white man makes. The share of women of color at or below minimum wage more than doubled from 2007 to 2012. Even the poverty rates for women of color compared to white women was more than double. car while at a job interview because she could not get child care. We recognize the many women who cannot afford a sick day or who have to take on multiple jobs. Many transnational and women of color have to work – and the choice to not work is a luxury and a privilege many transnational and women of color cannot afford. The service and minimum wage jobs that many take on are the least likely to offer benefits and have less job security. We cannot ignore that immigrant women are 70% more likely to lack health insurance compared to those born in the U.S. and without that help, they are unable to access adequate and affordable health care. The ability to adequately care for themselves and their families, while also working to support them, remains elusive and unattainable. Even with the new policies in place, transnational women need a swifter path to gain access to health care – the long wait currently in place can mean life or death for a hardworking woman and her family. This is not just about the gender wage gap–the feminization of poverty is about the very lives of women. The feminization of poverty attempts to rob women of respect and dignity, by stealing away their livelihood and the right and their capacity to live and raise their families with the resources we need to thrive. It devalues not only paid work, but also the unpaid work women do at home as caretakers and bearers of culture for our families. We demand that lawmakers and employers value the rights and lives of these women workers, from the home, the office, the factory, and the fields! Even with such low compensation and discrepancy compared to men, our labor supports capitalism’s demands and keeps economies of the global south afloat. Oftentimes women workers are the caretakers of families both in the U.S. and their home country and send the little money they save back through remittances. Entire countries are economically dependent and sustained by the labor of women workers abroad and in the U.S. We demand that governments and corporations protect and support the lives of those who struggle everyday for their families and to simply survive. The women of AF3IRM know this struggle–we see it in our communities, in our families, and in our homes. And now with the one-sided agreements the United States is currently making with other countries, we can already foresee these attacks on women continuing overseas and repeating injustices already made. We speak out against the current deals that the United States government works on that only seek to bully and exploit our homelands, as it looks to protect its investments and to sideline its enemies. From the Trans-Pacific Partnership (TPP), the Transatlantic Trade and Investment Partnership (TTIP) and the military pact to bring U.S. forces and bases back to the Philippines, we know that these deals only benefit the wealthy and the powerful. The U.S. is only using the Philippines as a strategic military stronghold, as it has done in the past, and these trade agreements put developing countries at a severe disadvantage. access to and put restrictions on resources and goods, including generic medicines and agriculture that people need. Capital constantly re-defines work to maximize profit. The last ten years have seen a disquieting trend toward the integration of work done by women for family and community into capital’s globalized system of exploitation. Women of color are moved from country to country to shore up facets of capitalism which are collapsing under their own contradiction. We know that these “free trade” agreements also only work to inflict more burden and harm upon women workers. We have seen it with the maquiladoras in Mexico and the export processing zones in the Philippines, Brazil, Indonesia, Guatemala, Honduras, and countless other countries. Corporations would once again have more power to abuse women workers as they circumvent labor laws, destroy their land, and eliminate the possibility for more viable and sustainable means of living. The uneven policies and unequal distribution of wealth also pushes women to migrate and leave their homes for other jobs and opportunities, separating them from their families. These women come to places like the United States – only to face the struggle against the feminization of poverty and a broke immigration system. And the return of the bases to the Philippines will only mark another chapter in the sexual exploitation of and violence against local women around the bases. These practices are unacceptable. The continued abuse and oppression of women needs to end! We march into the streets and stand in opposition to these free trade and military agreements! We call on all to value women’s work from the home to the office to factory to the field! We demand justice, not charity for the women workers being exploited every day! We demand the end to the feminization of poverty! 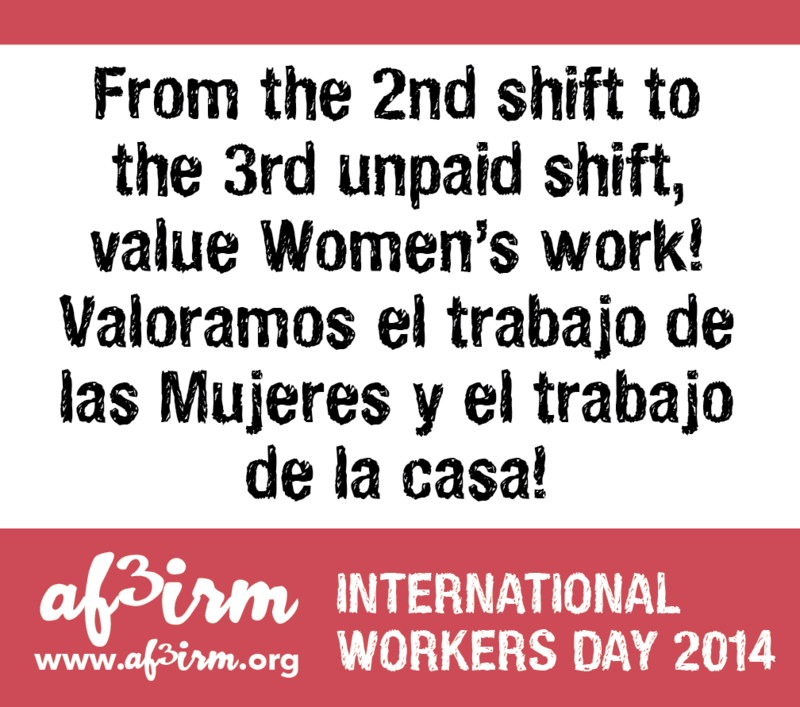 March with AF3IRM on May Day and every day as we make history and fight for women’s rights! Women Workers Unite Across Borders! Esta Lucha Tambien es de Las Mujeres! From the 2nd shift to the 3rd unpaid shift, Value Women’s Work! Valoramos el trabajo de las Mujeres y el trabajo de la casa! Transnational women’s liberation is the liberation of all humanity!